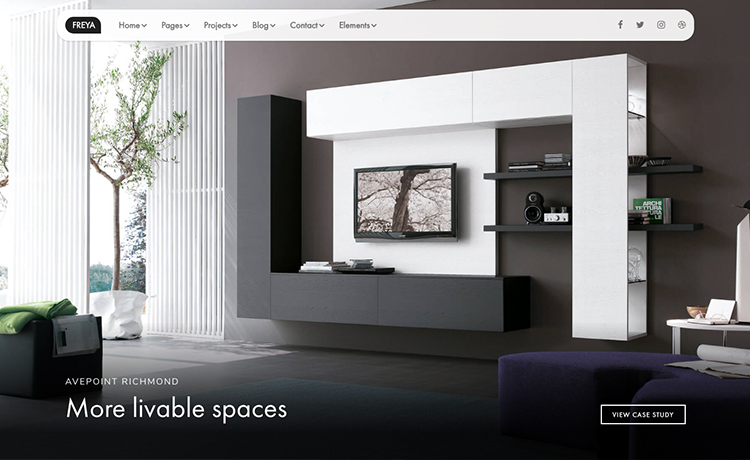 A Bootstrap 4 Premium Interior Design Template with multipurpose usage. Create an excellent website effortlessly with this super responsive HTML5 template. Meet Freya, a mind-blowing, multipurpose, responsive, HTML5 template. Specially crafted for any interior design websites out there. In addition, its structure enables a smart person like you to create any related website almost effortlessly. Be that agency, corporate and other professional organizations or blog, this Bootstrap 4 Premium Interior Design Template is totally up to it. Along with other modern technologies like jQuery, CSS or HTML5, Freya uses the brand new Bootstrap 4 framework. This famous CSS framework provide any kind of responsiveness you can imagine! Interesting enough? Let’s see some of the cool features it’s offering. Time, the most valuable thing you can ever imagine. The thing you always wish to have more but is never enough! However, there are things created for saving your time. From the invention of wheels to the idea of slicing the bread or today’s Freya, all are truely great time saver! Because of the revolutionary atomic-design of Freya, tons of strenuous coding hours are being saved. Isn’t that something to brag about? Then comes the awesomeness of Bootstrap 4. No matter if you have the giant 27″ iMac or the tiniest hand-held device, pixel-perfect responsiveness is guaranteed. Afterwards, Freya supports all the modern browsers, you name it! Freya is super easy to use too. You’re really afraid because you have no knowledge of coding? Who cares! All you need to know is how to type, copy and paste. Seriously, that’s all! With Freya, building your website is as easy as it gets! To begin with, Freya’s 29+ pre-built pages hands you the power to create whatever you think of. Copious animations and features make the potentiality unlimited. Built-in schemes for color, composition & typographic rhythm deliver the charming and aesthetic look you look for. Freya is miles ahead of its competitors. Let alone everything else, only check the unique Navigation Bar. Take our word, you simply can’t find any smart looking nav-bar than this! Though equipped with tons of features and technologies, Freya is surprisingly lightweight. As a result, your site gets a much faster loading time than the others. How beautiful does that sound? Turn your imagination into reality with the help of thousands of built-in CSS helpers that comes with Freya. What’s more? Do that even without writing a single line of CSS! The design impressed me at first. Then, I felt very comfortable to set up my site. By the way, I love the image selection. Thank you guys. Wow! Beautiful template, fits right into my ongoing project. One thing worth mentioning is the navigation bar. It has a super cool design. Hi, is there any way to have create a subscribe button on the bottom of the pages? Yes, you can. If you buy the template our support will help you to get what you need. the youtube video I am using it’s mute, how can I abilitate audio? If you buy it, open a support ticket. I can get sourcecode.Iam a student and am learning website.I don’t have money,my family poor.So can sir send sourcecode for me!!! Sure. You can get our free templates and use them in your study. Voila! How do I make it so its my email?